Huawei is a company that's increasingly hard to ignore when looking for a new smartphone. Regardless of what your budget is, the company has something available that's usually competitive, whether it's through its own-brand devices, or through its more fashion-focused Honor brand. But with so many phones available, it can get confusing. Perhaps no more so than with the latest budget-friendly, 18:9-screen Huawei P Smart. In almost all measurable ways it's the same as the Honor 9 Lite, except it inexplicably costs more. Is it a worthy alternative to the Honor phone, or just an unnecessary exercise in market saturation? If there's one element about the P Smart that's different to the Honor 9 Lite, it's the design. If you don't want a shiny, shimmery phone, then the P Smart is a more sensible choice. At just 72mm wide, it's very easy to hold in one hand. For reference, that's around 5mm wider than an iPhone 8, but the Huawei crams in a larger 5.65-inch display. Despite being palm-friendly, being a long-screen phone means it's still a struggle to reach the top of the display without shifting your grip somewhere. As you'd expect, the P Smart's front is mostly screen. It's not completely bezel-free, though. There's a slim frame up both sides, as well as the top and bottom bezel. The top plays home to the earpiece, notification LED and front-facing camera, while the bottom has Huawei logo. It's a pretty simple, attractive and restrained look; one that neither particularly excites or offends. It's a similar story on the back, where the only thing to break-up the black finish is the slim, chrome lines that separate the metal chassis from the plastic caps at the top and bottom, which act as the antenna windows. Both the fingerprint sensor and the dual camera are colour matched with the black back, to ensure the handset has a classy, minimal look. That's something you don't get from the ultra-shiny Honor 9 Lite. It's worth noting that - along with the narrow build - the P Smart's rounded edges help give a more ergonomic feel. Likewise, the fingerprint sensor placement is an easy reach for an index finger. The cameras are placed right in the top left corner and do protrude ever so slightly. As for those rounded edges, they're dotted with the usual collection of ports and buttons. The bottom edge has the single loudspeaker grille, Micro-USB port (yeah, in 2018, it feels outdated) and the 3.5mm jack (hurrah that it keeps this). If there's any criticism for the design, we find it's just a little plain. For some, however, that'll be a very good thing. It's solid, doesn't draw attention to itself, and will fit into your daily life without a struggle. One thing we're going to see even more of in 2018 is longer aspect ratio screens. The 18:9 trend kicked off with the LG G6 in 2017, and have continued to appear on other companies' flagship phones since. For 2018 they're making their way onto even more affordable devices. Considering its price point, the P Smart's screen is great. It's an LCD panel, which means you don't get the same contrast or colours as an AMOLED panel, but place it alongside an iPhone 8 Plus or Huawei Mate 10 Pro - both of which use LCD - and it holds its own fairly well. By default, our P Smart's display was noticeably warmer and a little more dim than an iPhone equivalent, but let's not forget that's a phone which will cost you more than double the Huawei's asking price. It's also important to note, within the Huawei's software you can customise the display's colour, choosing from an almost unlimited number of tones using a colour wheel. If you want it cooler, more green, more pink or more orange, you can make it so. By the time we were finished, we had it looking just as crisp, and slightly cooler than the iPhone. One issue with this display - which is a performance issue rather than down to the panel itself - is that video and graphics would often render at a lower resolution. Choosing a Netflix video, for example, the P Smart would take a few minutes for the stream to kick into a sharp image, if it kicked in at all. Sometimes it just remained at a low, jagged resolution for the entire time we watched. Some games ran at full resolution, but others - the South Park: Phone Destroyer - would render some graphics at extremely low resolutions, which is something that doesn't happen with higher-end devices. That wasn't the only display performance issue we came across either. Like most other 18:9 screen phones, there's an area in the settings to choose which apps show full-screen and which don't (just in case some don't display properly in 18:9). The problem is that only apps supposedly not optimised for 18:9 show up here, which meant only 15-20 for us, despite having dozens of apps installed. You'd think, if the app was "optimised" this wouldn't be an issue. Several apps posed issues due to this. Some would fill the screen but have key parts were cut off. Playing videos in the BBC Sport app would see the video controls inaccessible. Playing Injustice 2 would see the buttons in some of the menus - like when upgrading XP (or trying to) - cut off from the bottom of the screen. If you're an avid mobile gamer, you may therefore be better off looking elsewhere. In addition to the resolution issue, some more intensive games take an age to load, while others fail. We tried multiple times to get Asphalt Extreme working, but it just stuck on the loading screen. We had a similar experience with Hitman Sniper, too. We've seen Huawei's EMUI 8.0 before. It's the version of Huawei's own Android skin that runs on top of Android 8.0 Oreo, and is largely the same on the P Smart as it is on other Huawei and Honor phones. Oreo-ified elements are mostly hidden in the background, but you do get the now more condensed settings app, which groups options together in fewer main settings headings. There's also app badges when notifications are waiting. Press-and-hold the app icon when a dot appears and you'll get an actionable pop-up menu, which includes those alerts. Unlike some older versions of EMUI, you now get to choose whether you want the App Drawer, or an iPhone-esque all-apps-on-homescreen approach. Being a Vodafone exclusive currently means you do get My Vodafone and "Start" apps pre-installed as standard. But that's it as far as Voda-bloat goes. There's also the usual selection of standard Huawei apps: Weather, Calendar, Torch, Themes, Tips, Clock, Calculator, Compass, Contacts, Downloads, Files, FM Radio, Gallery, Health, HiCare, and Phone Manager, among others. If all you need from your phone is these core apps and social networking, among other basic functions, the P Smart performs adequately well. Its custom HiSilicon Kirin 659 processor is more than capable of dealing with daily tasks, switching between apps and screens. However, we did notice a little lag and stutter between touching the screen and the action performing at times, so don't go expecting a super-responsive experience. One other element of performance that left us wanting was battery life - a surprise given the battery capacity on board. We think a light user would more than likely get through a day without needing to plug in, but moderate-to-heavy users will definitely need to reach for the charger before a day is out. We finished most days with below 20 per cent remaining, and that's if we didn't hammer it to much with our usual selection of casual games. Playing roughly an hour of a game was enough to drop the battery by 20-25 per cent in our experience. Charging is also a bit of an issue: as the P Smart uses a Micro-USB socket, not the more recent USB Type-C connection, its charging speed isn't the latest and greatest. Which means longer at the plug to deliver on top-ups, which is time you might not have. The P Smart brings a dual camera arrangement to the rear, while a single camera sits on the front. It doesn't offer the big sell of quad cameras like the Honor 9 Lite. The P Smart's rear pair only use the 13MP camera to actually capture imagery, however, as the 2-megapixel one is used entirely for capturing depth data, which can be used in software later to apply faux "bokeh" effects for blurred backgrounds in Portrait mode. It works reasonably well, but you can expect some inaccuracies, too, especially when looking up close. In good light the P Smart is responsive and can snap photos fairly quickly, even focusing in good time. But the app start-up time and delay to focus when in low-light is a stark contrast to that. We've had the odd occasion when the app has stalled, delayed capture, or failed to respond to an on-screen press. That's sometimes meant it didn't take the photo, or took it too late, resulting in a blurry image (often of the floor, rather than subject). This intermittent lack of responsiveness isn't too dissimilar to what we've experienced using the phone in general (and from the Honor 9 Lite, too). Images from the P Smart themselves look decent enough, although the camera does struggle to handle contrasting light conditions. Often images comes out looking a little harsh, and lacking in colour or vibrancy. Even with HDR mode switched on (that's high dynamic range), it doesn't seem to be much better. What's more, it struggles to focus on objects that are close to the lens, which can be frustrating in use. As with all things, it's about setting your expectations. If the camera setup was lightning fast, reliable and dealt with harsh lighting conditions easily, it wouldn't be a £230 phone. This camera performs just about as well as you can expect for the market it's in, thanks to modes like Portrait, Panorama, and even manual control for fine-tuning of controls. However, compared to other £200-£250 phones and it holds its own pretty well thanks to a decent display, subtle design and modern appearance. Confusingly, though, the Honor 9 Lite - which is essentially the same phone with a funkier finish and more cameras - costs £30 less for no discernable reason. 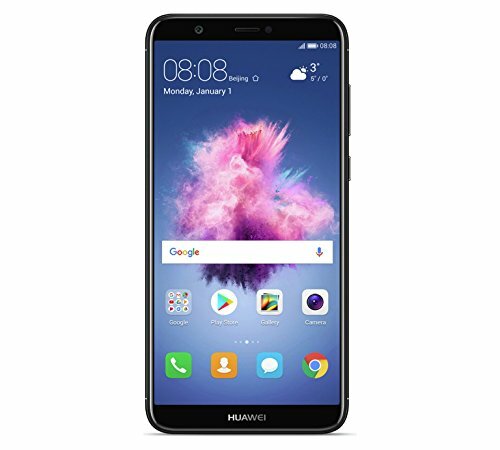 Overall, if you're looking for a sensible phone that you can buy outright or get on an affordable monthly contract, the Huawei P Smart is a sensible option. It's currently an exclusive to Vodafone in the UK, where you can buy it for £229, or on contract from £9 per month. As we've mentioned, the main reason to consider the Honor 9 Lite is that it it's almost identical to the P Smart. Except it costs less, isn't restricted to Vodafone, and offers a shinier and arguably more attractive finish. However, that glossy back does make it a little more slippery and attracts fingerprints more easily. The G-series has a strong history of owning the budget phone market, coming in with a slightly shrunken price tag compared to the Huawei. That said, the Moto is chunkier, less powerful and doesn't look quite as standout... but it is due for a G6 update in the near future. In the Smart V8, Vodafone has managed to launch a phone that costs just £160, yet one which looks and feels like a much more expensive device. It's also locked to Vodafone, which might see it the even more sensible purchase.